On Bombay-Agra road, about 2.5 kms. from the Taj Residency a small hillock is seen. 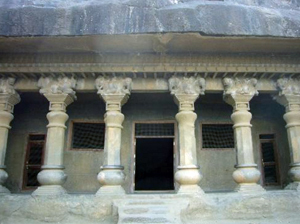 It houses the famous Pandavlena caves. From a distance you can see the hillock and the caves cut half way through the hillock. The climb is not very steep. The height of the caves must be about 300 ft. from the foot of the hillock. This is one of the beautiful places worth visiting. Many a mountaineers and trekkers frequent the place early in the morning or in the evenings. Not very far off from city, it is still a very peaceful place and gives a very beautiful panoramic view of the city. Maharashtra Government has taken up the area for cultivating forest and since 1996, more than 4000 trees of different varieties have been planted on the hillock. The place attracts tourists, archaeologists, trekkers and artists, since the view provides a beautiful landscape for painting. The caves are open for visitors from 8 a.m. to 5.30 p.m. everyday with an entrance fee of Rs. 2.Children below 15 years have free entrance. On Fridays, entry is free. As per the history, the caves have no connection to Pandava . The name Pandavlena is a recent version of the old name Trirashmi. Pandavlena caves belong to the 1st Century B.C. to 4th Century A.D period. This group of 24 Buddhist caves is one of the most important in Western India, particularly interesting on account of the large rare inscriptions of considerable historical interest found here. They were excavated between the second half of the 1st Century B.C. and the end of the 2nd Century A.D. by the Buddhist of the Hinayana Faith, who worshipped Buddha in symbolical form. 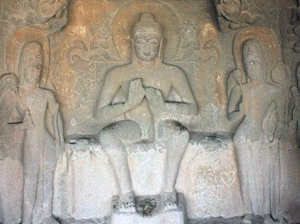 The images of Buddha carving in some ofthe caves are later additions made by the devotees of the Mahayana faith in CIRCA 4th – 6th Century A.D. 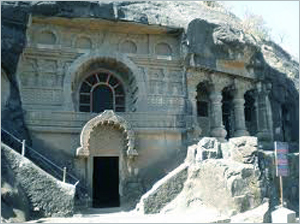 The ancient name of the place was pandavleni”Trirashmi” – the triple royal – the name of the Pandavlena caves being a modern application. The most important caves in this group are No. 18 and 20. Except cave No. 18 the remaining caves are Viharas or monasteries excavated in CIRCA 2nd Century A.D. Cave No. 3 was excavated at theorders of the Mother of the famous Satvahana King Gautamiputra Satkarni, who held sway over a large part of the Deccan in the 2nd Century A.D. In cave No. 10 there is an inscription regarding the donations made by Ushadatta, the son – in – law of Kshatrapa Nahapana (CIRCA 120 A.D.). Similarly cave No. 17 contains an inscription stating that a “Yavana” (the Greek) named Indragnidatta and his son Dharmarakshit excavated this vihara with a shrine and the cisterns.